Air and space travel can place extreme demands on critical control and information systems. 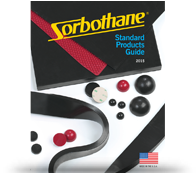 Sorbothane® components help protect these important systems during extended travel in harsh environments. For example, NASA uses anti-vibration Sorbothane® mounts to isolate vibrations and protect spacecraft-mounted cameras from violent forces experienced during takeoff and landing procedures. The International Space Station also uses Sorbothane® for vibration isolation on its treadmill during exercise periods. See samples of solutions we've provided to the Aerospace & Aeronautical industry.